Hospital employee Angela Eaton donates blood with her son, Thomas, at a blood drive at Akron Children’s Hospital. When Angela Eaton was 9 years old, her mother was diagnosed with chronic kidney disease. Throughout the years, she required many blood transfusions and two kidney transplants. As Eaton grew up, she knew she wanted to help her mom and others like her in any way possible. As soon as she was eligible, she went to a blood drive, accompanied by her mother, to donate. Thomas was nervous to donate blood for the first time. Unfortunately, Eaton was unable to donate due to certain exclusion requirements at the time about living with someone on hemodialysis. “That was a crushing blow. I was really excited to donate,” she said. A year later, after her mom received her second kidney transplant, Eaton attempted to donate again, with her mother by her side. This time, she was successful. This year, Eaton was joined by her son, Thomas, who recently turned 17. He donated for the first time in honor of his grandma, who passed away 13 years ago. Braving the needle runs in the family as Eaton is also not fond of the poke. Thomas was comforted by one of the Red Cross nurses while another nurse stuck him with the needle. Eaton and her son donated blood during a drive at Akron Children’s, which helps the hospital as well as other patients. 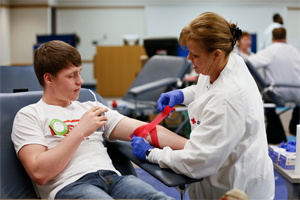 If the hospital reaches certain collection goals during its drives, the American Red Cross will sell blood to the hospital at a discounted price. It’s a need that increases in the summer. Spoerke, a regular donor, stressed the importance of donating, and encouraging friends and family to donate. There are regular blood drives at the Akron and Beeghly campuses. 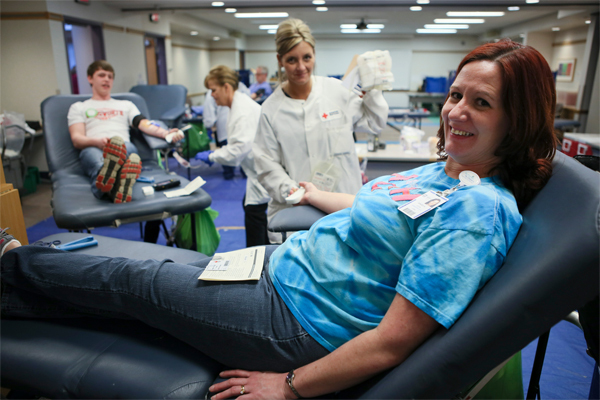 Recently, The American Red Cross honored the hospital and blood donors with the “Going the Extra Mile” award for hosting 14 annual blood drives. But if you’re worried about that needle, Thomas encourages you to look beyond the small jab you’ll feel.